PC + HoloLens: Would It Work? We know that HoloLens is a full PC. It is supposed to be running on Intel Atom CPU(Cherry Trail to be specific). It should run any Windows universal app from Windows Store, and theoretically any traditional Windows software, for example AutoCAD. For one thing, Atom CPU is not powerful enough to run CPU intensive applications like AutoCAD. For another, it’s always better to leave heavy computing to a powerful CPU and let HoloLens work as input and output device. Would this work? And How? Xbox + HoloLens: How Can They Work Together? To answer these questions, I revisited Microsoft’s original promote video, looked closely at the motorcycle design portion of the video, and find out the answer. The answer to the first question is yes and I will guess how. Well, I am assuming the video content about the motorcycle part is not pure illustrative, but captured by HoloLens. Or at least this video indicates how they can work together. I have great confident in the first scenario, and I have little doubt in my conclusions. Lets get to it. First I want you to look closer at this picture (above) from the promo video. 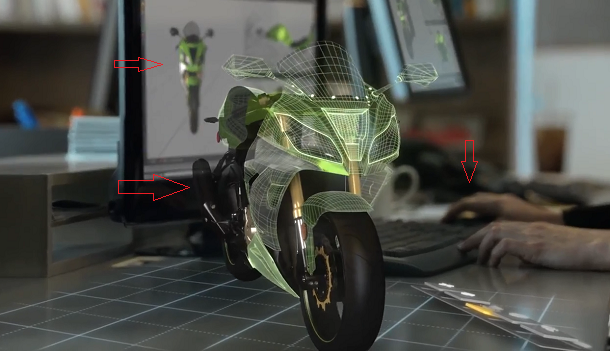 I have marked three import points to watch for: The motorcycle AutoCAD(maybe another software) 3D view on the desktop PC monitor, the holographic motorcycle on the table and the designer’s right hand. The setup is this: The designer is sitting in front to desktop computer, using traditional keyboard and mouse. He is designing a motorcycle on his desktop, as the monitor is showing. In the mean time, he is also wearing a HoloLens, therefore, beside the monitor on the left, he can see a hologram of the same design in 3D. Important thing is: While watching the video, the designer’s right hand, the 3D view on monitor and the hologram all in sync. I have cut this portion from the original video, and make it playing at 50% of normal speed. Not really slow motion, but makes it easier to see the moment. Now watch this piece of the video below, pay attention to about 3 sec mark. What the above video has shown is the PC and the HoloLens works in collaboration. The use case displayed in the video is HoloLens works as a second display. The designer still does what he normally does on a PC, and the keyboard, mouse, monitor is still there. The system that is running on is probably a powerful workstation. At the same time, the designer also see the hologram in 3D. Interesting thing is the hologram can also be manipulated by the mouse. Furthermore, HoloLens is also used as a input device, for example, the designer can type on the holographic console beside his left hand. I would assume his hand gesture works as well. I think this will be the most common scenarios in an office setup with HoloLens. HoloLens works as an extra input/output device, instead of replacing keyboards, mice and monitors, enhance them. 2D or 3D is not really the point, the point is: the content that is traditionally contained in the monitors, now break free. You can have 10 screen scatters everywhere you see. You can put an Office window far way on the wall across your coworkers, only you can see it. In next post, I will try to answer the question: How it works.